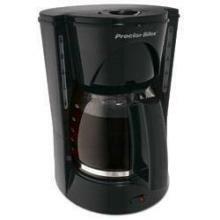 The hamilton beach 48524 12-cup coffee maker is a simple coffee machine that costs around $20. I have tried using this in the past but was not happy with its result. The coffee it makes tastes diluted, even when I added extra coffee. The carafe is always dripping when I pour so that is another problem. Even though it is an easy to use coffee machine, I am not a satisfied user with hamilton beach 48524 12-cup coffee maker.